Louis Royer is probably better known now than it has ever been during its long life, as a result of its takeover by the giant Suntory organisation in Japan. The firm was started in 1853 by its founder Louis Royer. He was a chief blender at another cognac house and he decided to establish his own distillery. He was an avid beekeeper and a bee is enshrined in the firm's coat of arms. Louis Royer is said to have chosen the bee as an emblem from the very beginning of his business and is said to represent the values that have always prevailed by the house, that of diligence and an efficient and lively organisation. It is also the regional symbol of craftsmen and their work. The family firm has been situated in Jarnac and they have occupied a splendid chateau near the town centre close to the Charente. This is also where the cellars and offices are still located. Five generations of Royer family have run the firm, but since it was taken over in the 1990's the quality of the cognacs have not improved and their range is now entirely blended. The firm ships over two hundred thousand cases of cognac to many countries as well as more than two hundred and sixty thousand cases of brandy and a further one hundred and thirty thousand cases of vodka and liqueurs. With a turnover of more than 30 million euros and more than eighty employees, cognac has ceased to be a speciality and what was once a great cognac house has now moved into the realms of globalisation. 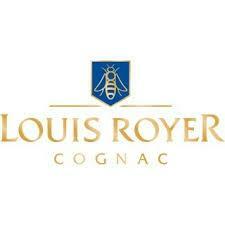 Their young cognacs are mixed with caramel and sugar syrups.